If you wish to speak to someone urgently to reserve a date for the hearse and can not get us on the office number our emergency only number is 07799 030305 for Clare Brookes, please leave a message or send a text, if we can not answer we will get back to you as soon as possible. Please DO NOT use these numbers for any other enquiry or for sales calls. You may also text us, we can not always answer while we are out on a funeral, thank you. If you are considering hiring our Morris Traveller for a funeral we need to know where in the country the funeral is taking place in order to calculate the cost for you. If you have a funeral director in mind please would you let us know who they are. Please make sure that if you wish to book with us that you check our availability because we are generally unable to do more than one funeral per day due to the distances we cover. We will pencil in an enquiry for a maximum of 24 hours while you make arrangements, after this time we assume that you do not require the hearse and it will become available again so please keep us informed. 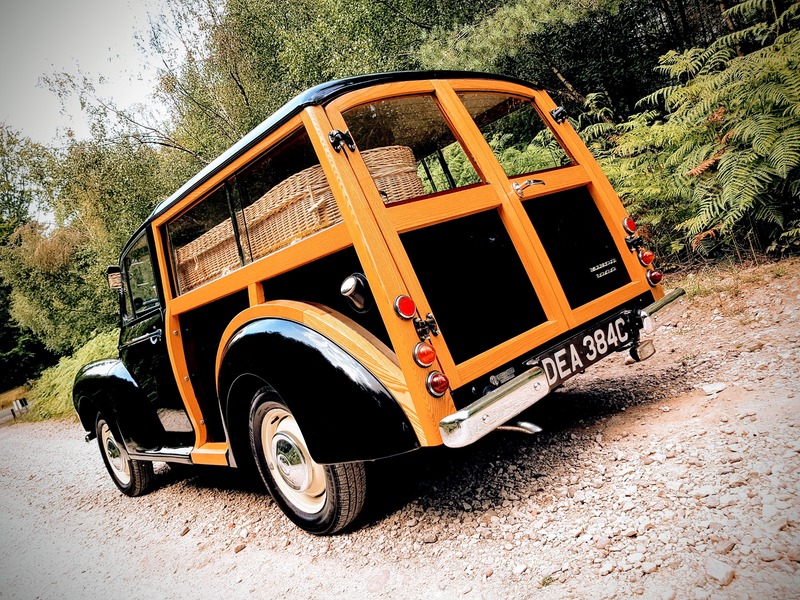 IMPORTANT: A Morris Traveller isn't a big car so there is a size restriction on coffins, we can strictly only cater for 82" X*24" X 18", If a wider shoulder needs to be catered for we will not be able to have a passenger in the rear seat and so a funeral director would need to travel in another vehicle. This is based on a traditional shaped coffin. Please feel free to ask about sizing. Some floral tributes may be catered for but please ask. The taller the coffin the less room available to put a coffin spray on top so ideally a low arrangement is best or the tribute will be placed at the side of the coffin. To book our service we will require an email confirmation from you / your funeral director to confirm your booking to which we will respond with a schedule and a copy of our terms and conditions. Please ensure that you have received our confirmation email as it contains information about your booking. If you do not have this then you may not have made a booking with Morris Minor Funerals. All bookings are made on a first come first served basis and there is no obligation to book. Trudys deck 82 X *24 X 18 max. There is an extra flower board for when the rear seat is not in use. Please complete this booking form, our terms and conditions are below for your perusal. Booking the Morris Minor hearse assumes that you agree with our terms and conditions. When booking a vehicle please familiarise yourself with our terms. Hiring the hearse assumes that you are in agreement with our terms and conditions. Thank you. Promotional material for funeral arrangers/directors. Hearse booking enquiry: Info required - Date, addresses the hearse is required to go to ie. home, church/service crematorium/burial ground, times, and any additional information.